Did you enjoy your weekend? Ours was jam-packed and I am looking forward to five days off at the end of this week! I took a couple of vacation days to extend my long birthday/Labor Day weekend. I have been dealing with lots of sinus based allergies lately and wanted to try oil pulling for various reasons. I finally got the coconut oil out on Saturday morning to brave the process. I tried it two times, gagging both times and spitting it out after two minutes. I know this sounds crazy, but it seemed to even make my mouth feel different after that tiny bit of time. I want to try it again, maybe with sesame or olive oil. Mid-morning, we drove out to Pewaukee to the Parade of Homes. I didn't love this set as much as the Lisbon ones, but I did find a few houses that were unique and featured cool things. This is definitely going in our laundry room someday. This craftsman style home was the most unique one we saw and despite lots of wood vs. white trim, I loved it. It felt warm, full of storage options, and worth the money. I also loved the master bedroom suite layout. The bathroom was at the front of the house, separated by the closets and then the Master Bedroom at the back of the house. The Master Bedroom is pictured below. I loved the white trim on this side of the house, making the bedroom area feel relaxing and spa like. A very Frank Lloyd Wright door. I've always liked his architecture and that he was from Wisconsin. Craig loved this bookshelf but realized I'd probably fill it with a bunch of "junk!" We ran into Craig's cousin and her boyfriend in a house and she came and found me to say that we'd love the feature in the laundry room. Pretty fun, huh? I enjoyed seeing the interior design features in the houses too. I feel like I really like the styles right now and should buy towels, pillows, bedspreads, etc. now before we move to a new house because otherwise I won't like anything when we move! We ran errands in Brookfield after our house touring and then I crashed on the couch when we got home. I finally got up and went to the YMCA to cancel our membership, sign up for a free Personal Training session (to secret shop and learn some things) and then hit the sauna, pool and the whirlpool. I messed up my knee in Barre class on Monday and I figured swimming would be good for it. I was right! On Sunday morning, I did some housework and listened to Ed Sheeran's Sing to energize myself. Shiva also enjoyed the video and was mesmerized by the music. After mopping the kitchen and bathroom floors, I got ready to attend my friend Kim's bridal shower downtown. Here are the lovely friends I went to high school with and Kelly's daughter! My friend Jenny's condo complex had a cute Little Free Library outside, so I picked up an Agatha Christie book. I have never read her books before but I love mysteries and so does my mom. I had to park along the river because Mexican Fiesta was going on in the same area as the Bridal Shower. Luckily, the long walk offered beautiful views of Milwaukee. I had no clue this paved trail existed and linked up with Lakeshore Park, so I've convinced Craig we need to go biking along there next weekend. Craig and I celebrated our 5th wedding anniversary on Friday! I can't believe how quickly time has flown by. It seriously feels like we we just got married last year or something. He was super hungry on Thursday night, so we opted to go out to eat then to celebrate! I wanted to try Honeypie in Bay View and he found something on the menu he liked ahead of time (he's a bit of a picky eater compared to me). 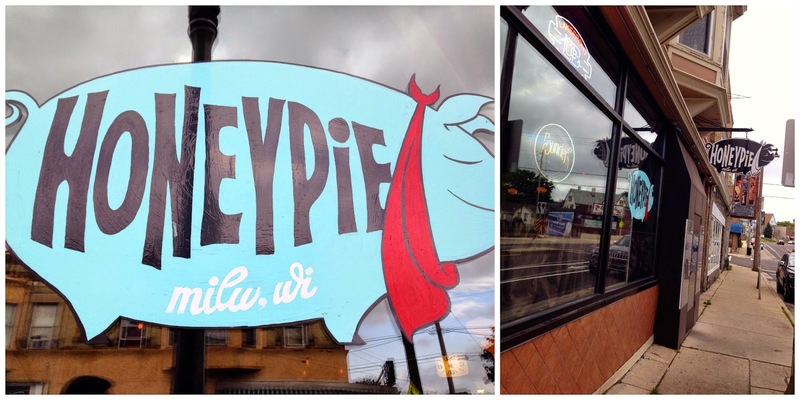 Honeypie was voted as one of the top 30 restaurants in Milwaukee in 2013. We took a selfie, complete with a Trivial Pursuit card. I come from a family who loves Trivial Pursuit and my siblings and I have a lot of useless facts in our heads. Craig's family is the exact opposite, so he doesn't really love the game. He quizzed me a bit and then we chatted the rest of the time. I enjoyed a Green River Razer cocktail. It had Green River soda, a splash of lemon and Ginger Brandy. It was tasty! Craig looked at the menu online before we arrived at the restaurant and had his heart set on a Spicy Chicken sandwich, but it wasn't listed on the menu in-person. He was kind of disappointed and opted for a "Klug" sandwich with Field Roast (veggie protein), jalapeños, etc. I had the Veggie Grinder. Both of us loved our sandwiches. In fact, while eating his leftovers at work the next day, Craig e-mailed me with the subject line "god I love my sandwich." I teased back, "what about god, I love my wife of five years?" Naturally, we had to end our meal with pie! I had the pistachio, which I had only tried a bit of before thanks to Karis. Craig had the Black Bottom Banana Cream. Both were indulgent and delicious. We had to take the leftovers home too because we were stuffed. We walked off dinner and dessert by strolling down Kinnickinnic Avenue after. I liked this sign outside of a very vintage looking gym. Great way to sell personal training, huh!? We also found a really weird bookstore, where the owner seemed to live out of the middle of the store floor. He had couches, medicine, a TV, etc. setup right in the middle. Oh Bay View, you're so quirky. What a fun night celebrating our wedding anniversary! I had a great Monday, despite feeling pretty tired at work today. The cats enjoyed waking us up multiple times last night. I booked our flight to Colorado! Frontier Airlines is offering great prices right now if you time your trip right. I immediately searched for an image of Garden of the Gods and made it my desktop at work. It looks gorgeous. I am convinced we must go there at sunrise to get pictures like this one. I tried an hour long Barre class at work tonight! It was my first time trying it and I loved the challenge. I had a lot of fun and it was totally as tough as I thought it would be. I hadn't done some of those moves since I took ballet as a little girl. I guarantee I am going to be sore tomorrow. Unfortunately, I haven't had any clients in my new job yet, so I have just been trying to learn as much as possible about the club and help out at the front desk. I am looking forward to getting to know some members and train! Have you tried Barre before or any new group exercise class lately? Life is busy lately and I've really missed blogging in the past couple of weeks. Here's what I've been up to the last 8 days. Parade of Homes in Lisbon with Craig. I liked most houses we saw. I definitely know what I love in a house: screened in porches off a kitchen and master bedroom, white trim and kitchen cabinets, rounded doorways, big windows and lots of light in general, and a grey/blue exterior. We picked up Jamba Juice after. I had a juice instead of a smoothie and it was delicious. Join their rewards program for great discounts and a free b-day smoothie (Craig got his, I got $3 off my juice). Last Sunday, we went to State Fair with my parents. My dad's military card got us all in for free and all of us hadn't been to the fair in about 10 years or so! A house near the fair always features themed windows throughout the year. I enjoyed seeing the horticulture building and the winning food entries! My mom said that the gladiolus was one of my Grandma's favorite flowers. I love learning things like that. I'll think of her every time I see them now. Like most people, clowns terrify me. This garbage can is just creepy. I love animals and enjoyed seeing the rabbits. We found one named Mary, like my mama! This vegetarian couldn't bear the cow and goat buildings. Looking into their eyes makes me want to cry. I've been like that since I was a kid though so it makes sense that I became vegetarian for ethical and health reasons. Here's a typical State Fair scene. Our 5th wedding anniversary is next week and while we wanted to go to Hawaii in the winter months to celebrate, we also have a bit of travel fever lately (well I definitely do, Craig just seems to sort of have it). Planning a trip to Colorado just seemed logical and easy to do compared to Hawaii. Flights to Denver are really cheap right now and we're hoping to head out there in October to do lots of hiking. We think we'll split our time between Colorado Springs and the Boulder area, with a visit to Rocky Mountain National Park too. If you've been to the Denver area, I'd appreciate suggestions! I've only been to Aspen and Snowmass to ski. By Thursday night, Tanzi appeared lethargic and couldn't jump onto Craig's lap. We booked an appointment with the vet for Friday afternoon and hoped it wasn't something serious. I was home on Friday morning because I worked late at night, so I was able to watch his behavior. I caught him licking a lot and finally spotted a bad sore near his bum. He has an abscess and thankfully, they put him under and drained it. We hope it's healing up now and he'll recover soon. The poor little guy had a 105 degree fever! If we hadn't acted quickly with getting him into the vet, we could have lost him. Cuddles from Shiva comforted me while I worried about his cat brother. My colleague said that cats sit close to your face like this because they feel your heartbeat and it reminds them of snuggling their cat mother. A scene at work on Friday night. I worked again on Saturday morning, with a 5:45 a.m. arrival time, so the rest of the day was sort of shot. After a short nap and catching up on house work, Craig and I ran errands. 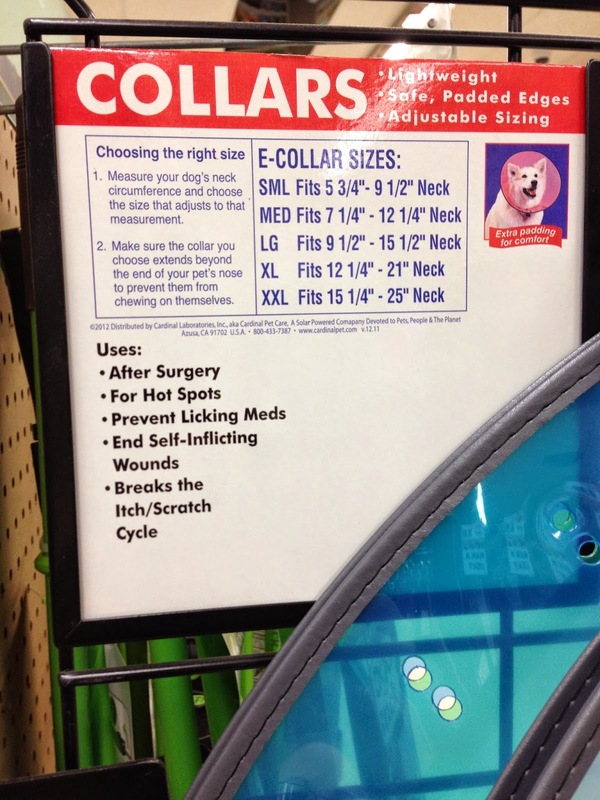 We shopped for collars/cones for Tanzi. He still keeps licking his wounds. I hate the idea of putting a cone on him. We stopped for fro yo too. I went a little crazy with the toppings. At my new job, I trained some more, took a tough ringside class, and learned how to check the pool's chlorine and ph levels! I also had a great sales training and learned a lot there. Next week, I am supposed to start training clients if my book fills up with appointments! I sort of feel ready, but I'm also a little nervous. Enjoy the rest of your Sunday! We're off to Irish Fest, where my work is hosting a summer party. 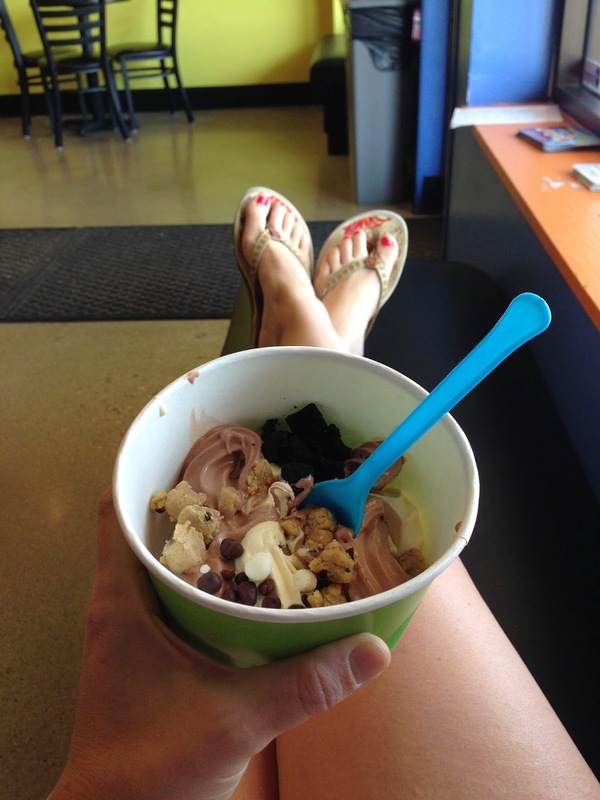 How are you fueling your workouts? 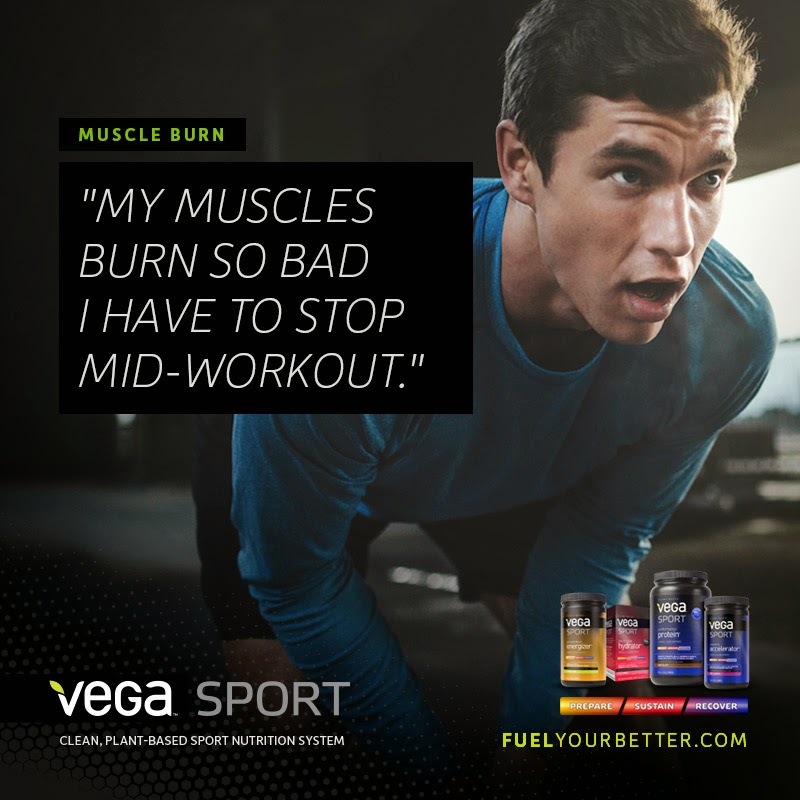 Vega has designed new products to assist in fueling your workout. I received the Vega electrolyte hydrator through my ambassadorship with Sweat Pink. You can click here to learn more about which type of product would be right for you. I tend to have lactic acid built up when doing long bike rides or intense workouts, so the Vega hydrator was the perfect fit for me. I received the berry and I was glad, because I prefer berry flavored drinks over lemon lime. I used the product numerous times within the last two weeks and noticed that I had more energy during my workout and after. Here is the supplement information, if you're interested. 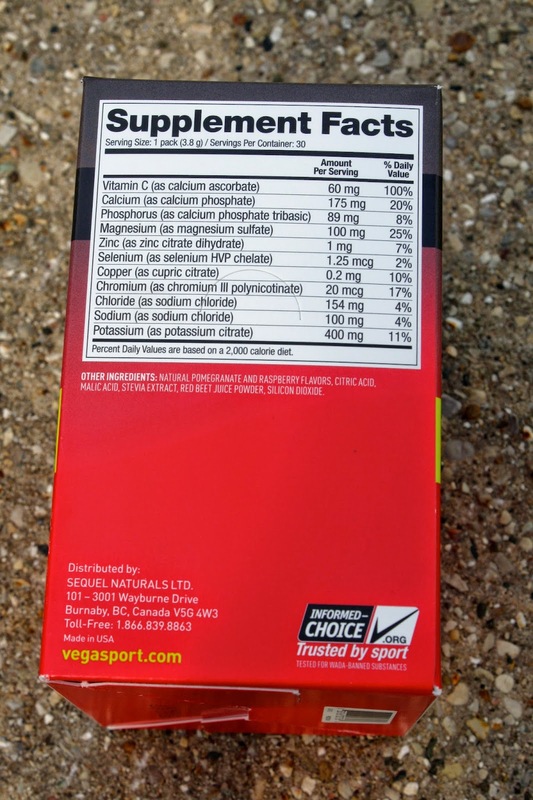 I received the Vega electrolyte hydrator complimentary through the Sweat Pink Ambassador program in exchange for this review. We had a great weekend filled with lots of fun activities! On Saturday morning, we headed to Wauwatosa. Craig dropped me off at the farmers market and within a minute of being there, I ran into my co-worker. I walked around the market with him and checked out the "makers" side of the market, which featured local crafters. I purchased an Iced Coffee from Hawthorne Coffee Roasters. They're pretty new to the coffee scene and based in West Allis. After listening to some music and checking out every booth, I settled on getting some corn on the cob. 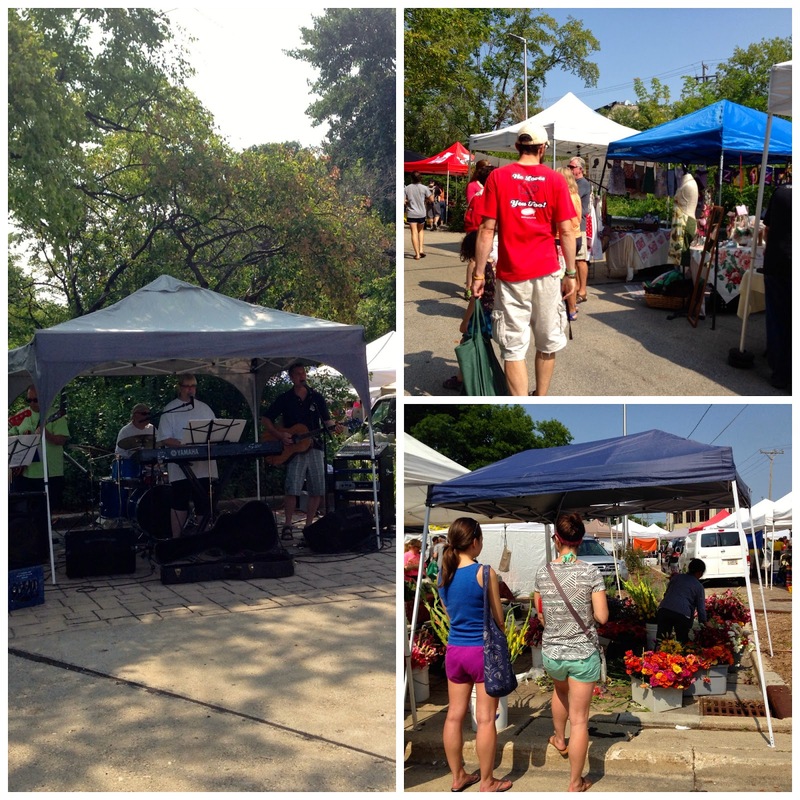 There was a great selection of vendors and I'l definitely be back to the Tosa Farmers market in the near future! Craig picked me up and we went to my co-workers' house to check out his wonderful garden and snagged some green beans to bring home! Next, we headed to Brookfield to check out the uniform shirts I have to buy for my new "parallel" career (as my colleague was calling it). I was getting a little hungry at this point, so I enjoyed a bar I had been keeping in my purse for a while. It was delicious! Here I am trying on two different types of black Nike shirts that I have to order with my company's logo. I'm bummed because I have a headshot in a week and they don't have my size online right now. I was hoping I could purchase a shirt in the store, but that wasn't possible either. 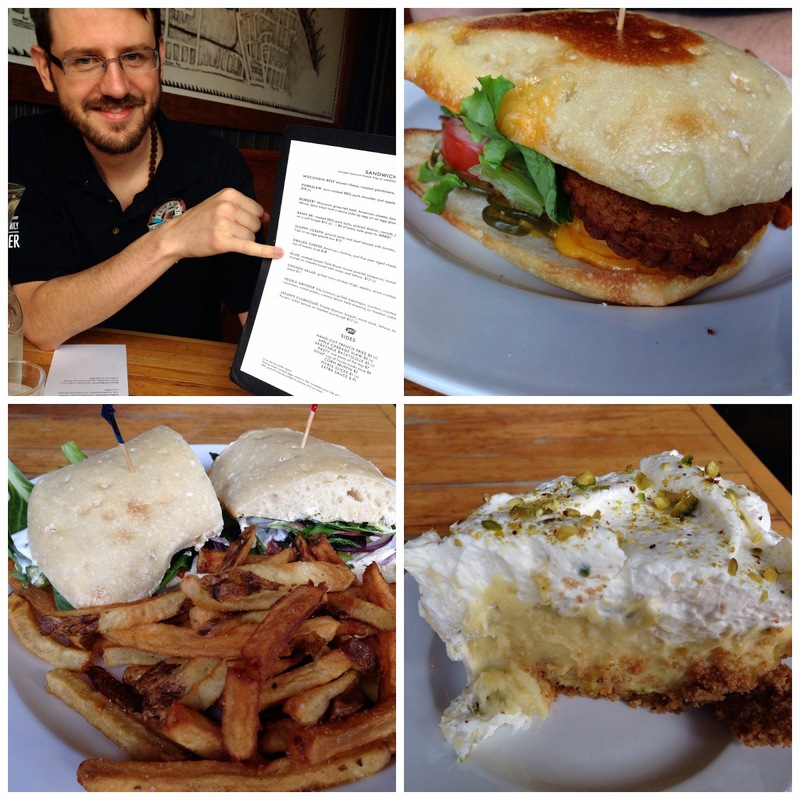 We were ready to eat lunch, so we headed back to Tosa to Cafe Bavaria for their brunch menu. It was Craig's first time there! I enjoyed a Schofferhofer Grapefruit Hefeweizen beer! It's the perfect summer drink! I ordered Bertilda's Breakfast--lots of fresh vegetables and poached eggs on top. Craig got a jalapeno cheddar wurst, scrambled eggs, potatoes and bread. I tried some of the amazing bread and ate most of his potatoes too. Once home, I took a long nap with these guys. They were so snuggly with me and each other all afternoon. 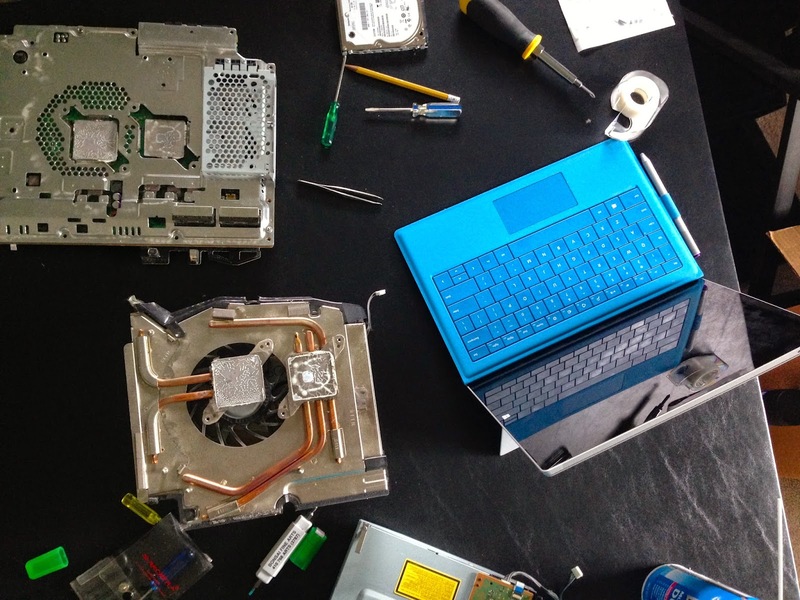 While I napped, Craig worked on trying to fix a Playstation his friend gave him. That's his fun new work toy, a Microsoft Surface. And today, I cleaned, read some things for work (learned a bit more about TRX), and then we went to see Lucy. It was excellent! How was your weekend? I so need another day, but I'm prepped for another super busy week.